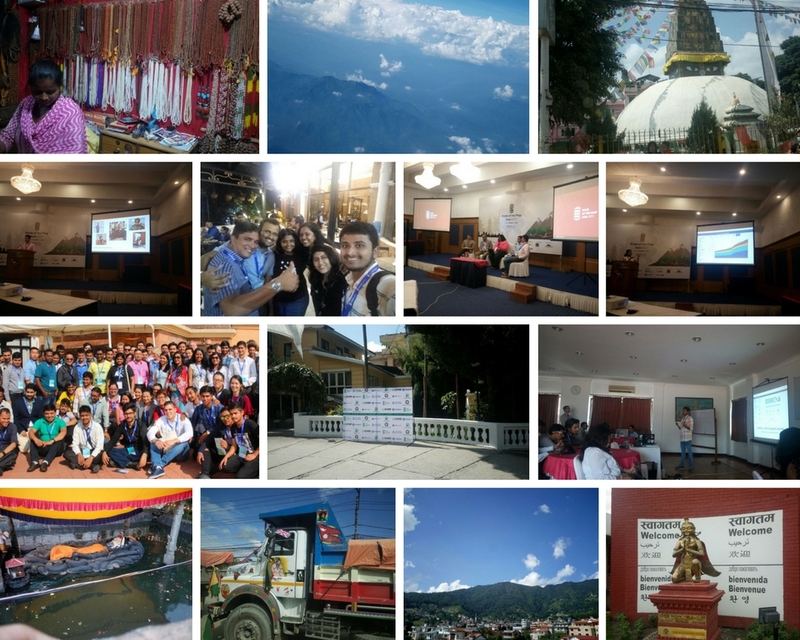 Great meeting everyone at Kathmandu and share my completness research. Here’s the link to the slide deck from the talk. Like discussed, we’ve put up a front end called osm-analysis-dashaboard which combines completness research and Jennings’ contributor behaviour metrics in one place. build an amazing dashboard that help gain insights on completeness relation with contributor behaviour. Do drop me a message with your suggestions/questions. Happy to talk through this! Quite excited to be at the SOTM Asia 2017 Conference in Kathamandu this weekend. This year I’ll be talking about my OpenStreetMap readiness assessment work and walk through on how the approach varies from prior art, opening new avenues for mappers to explore data coverage. I’m also collaborating with Jennings Anderson on his contributor metrics analysis & trying to understand how does mapping community health reflects on the readiness work. Continuing from our earlier efforts, our data team at Mapbox and local mappers in Silicon Valley have been diligently tracing missing buildings in San Francisco Bay Area. 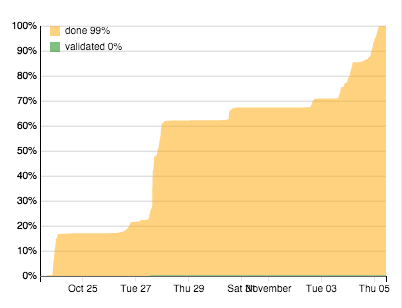 To date, three Tasking Manager projects are up (#1,#2,#3). Over 100,000 buildings were traced and validated. 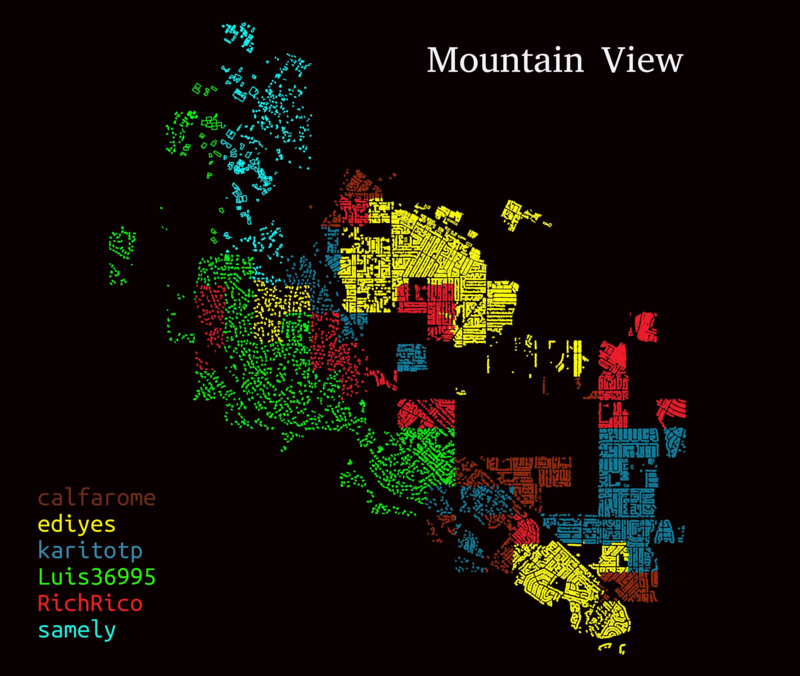 Here’s a snapshot of our mapping for Mountain View. The [most recent task] (http://tasks.openstreetmap.us/project/15) focuses on filling the gaps. Join us in tracing or post feedback on Github. 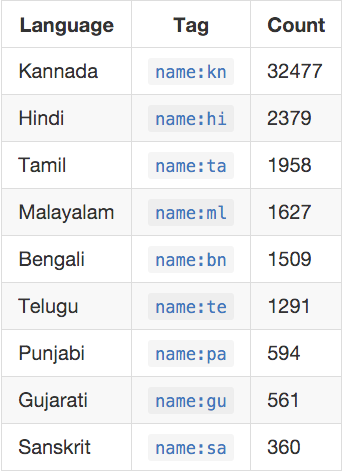 A quick lookup on the present state of Indic language tags in OSM. 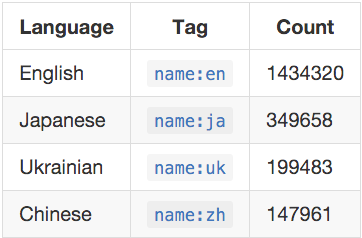 Compared to other language tags, this is a miniscule number. And there is no Indic tags that feature in the top 10 list. However there is some real good work that is being done with name:kn tags. Personally I would love to see more tags in my mother tongue Tamil and I wish more contributors work towards Indic language tags! As part of the Japan road improvement series, OSM Japan community has successfully completed the mega Tokyo task of re-aligning the major roads with the orthorectified GSI imagery. Next in the pipeline is road improvement in Nagoya city. Nagoya being an urban area like Tokyo, is well mapped and the data density is huge. And the objective here remains the same as the Tokyo mega task. Do visit the task page on teachosm, http://tasks.teachosm.org/project/104 for instructions on how to go about the task. Also you can get more details on data issues in Japan, from earlier diary entries of PlaneMad and pratikyadav. Japanese tranlsations are available in MAPconcierge’s diary entries, here and here.